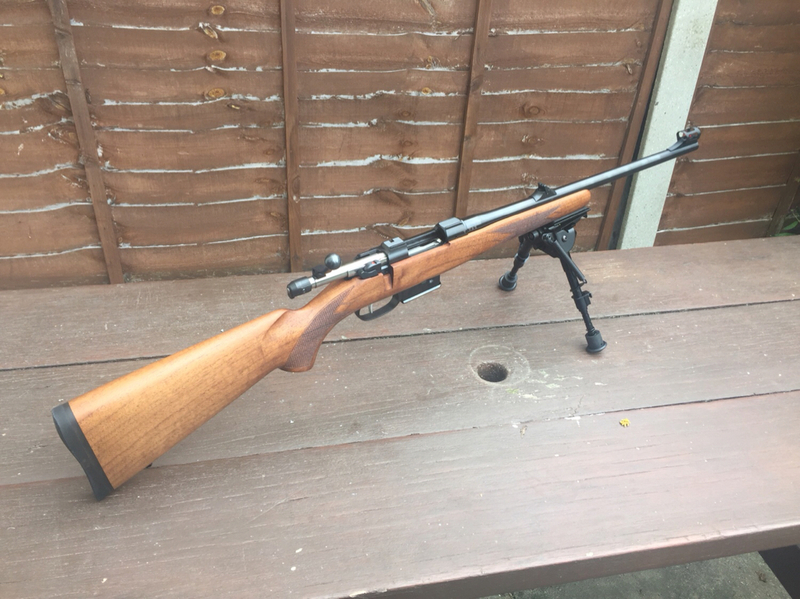 I’ve just got my first new centre-fire rifle and very lovely looking it is too. Classic walnut wood and blued metal. It’s a CZ527 Carbine in .223 with 1 in 9 twist. I wanted something that would be a good all-rounder to shoot from various positions and will work with both iron sights or a scope. I expect I’ll be mostly shooting out to 300m, maybe a bit further sometimes. I figured .223 is good for getting lots of rounds down range cheaply and will be easier on the shoulder than my Mosin. I also wanted something small asI have two kids that shoot already and a third desperately waiting to be 13. Hopefully I’ve made a good choice. I understand I need a decent set of flat sided screwdrivers so I don’t foul up the screws. The Wheeler sets look pretty comprehensive, so will probably have what I need. Although, I’ve read magna-tips might be better quality but I’m bewildered by the choice and don’t want to spend £500 for the full set. What’s best out of #81, #84 hollow and the clip or magnetic LE handles? Is it just the 22 bit starter set I want? There are various standard sets, pro sets or master sets. I don’t want to buy cheap junk but I’d rather not spend several hundred before I have even started. How do I work out what I actually need? I want to get some Quick Detach rings, so I can use the iron sights or scope without needing to re-zero each time. I’ve read that Warne QD medium rings are good for the CZ carbine, so I was thinking of getting some. I have a Hawke 3-9x40 scope at present which I’m hoping will do until I have a bit more experience then I can choose a nicer Leupold one. Any thoughts? Is 3-9 the right power? To fit the Warne scope rings I’ll need a T-15 Torx bit. Warne do a specific 25lb torque wrench but for a few quid more the Wheeler fat wrench seems a better buy. Is that right? If I’m getting the fat wrench will the Wheeler bits in the screwdriver sets interchange or are all of them interchangeable anyway between makes? Next ammunition. I’ve got 100 55gr .223 FMJs to start but I believe the 1:9 twist might like heavier bullets. 62gr or 69gr or heavier? I’ll want to reload eventually but I’ve got so much to learn I figure I’ll do it in stages and stick to factory ammo for now. I can't advise on teh screwdriver bits, although i am planning on getting a FAT wrench when i'm out in the US next month. 1:9 should be fine for 55gn (and possibly lighter) up to 69gn bullets. Thanks Daryll. I think the FAT wrench will do the job, so is probably worth getting. I too have a CZ 527 and can confirm that 69gr Sierra Matchkings and 69gr Lapua Scenar's shoot really well out of it. Thanks WS. Is yours 1:9 twist? It looks great. I can’t wait to shoot it. In regards to rings, I've got the warne QD ones, I really like them. They seem well made and return my rifle to zero when I take the scope on/ off. Additionally, they're not stupidly expensive. (they go on my 223 so in theory, it should be relatively comparable). Yep, it's the 1:9 twist. I have the varmint version with kevlar stock. It's a really accurate rifle, like a laser beam! In terms of rings, the Warne split rings are good but are a bit of a faff to set up compared with normal rings. One word of advice is to start with high rings. The bolt handle might not clear the ocular eye piece if you mount the scope too low to the barrel. The other problem you'll have then is having a chin weld on the stock because the scope is too high! Easy remedy is to put one of those padded cheek pieces on. See attached pictures. I think you'll really enjoy your rifle, you get a lot of gun for the money But I would say that since I have one! WS, I read that the bolt handle was altered to make it less of a problem and that the Warne medium rings specifically are okay with the new bolt. However, mine bolt doesn’t look any different to yours, so I’ll have to make sure the seller does returns if I go for the medium rings. I originally acquired a 527 in x39 two years ago now... mainly to shoot cheap Russian steel cased stuff. This it does very well and sub moa... although the irony here is that Spam Can are now unicorn owing to Russia's activities! I liked it so much that I bought my son the 223 version about 6 months ago - the only issue there is that as he's only three then I have many years of me time left to shoot it in isolation. Both have Warne medium mounts and Bushnell Trophy 3-9 scopes on top. The bolt handle was redesigned by CZ to wrap around the scope a few years ago now. The SST is really nice in my opinion... and they are both very accurate compact rifles for the money. That’s what I call planning ahead! I was very much in two minds about the x39 or .223. I went .223 in the end because of the ammunition reliability and I think it should shoot flatter to out a bit further. It seems nicely made, although the bolt is a bit scratchy and probably needs a polish.